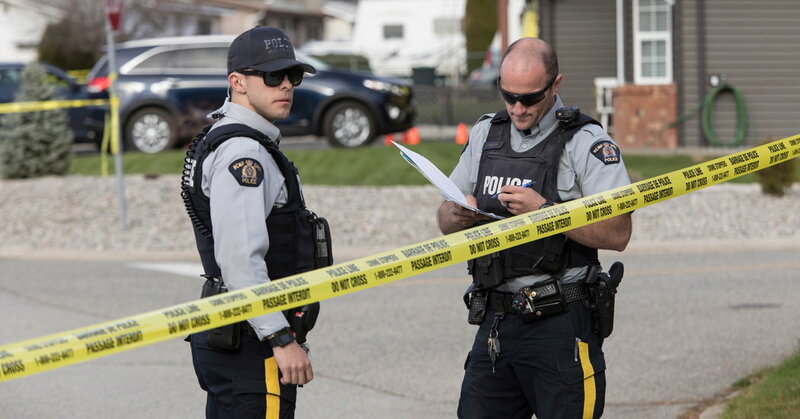 A 60-year-old man was arrested after allegedly killing four people in a "targeted" series of shootings on Monday, the police in British Columbia said. The gunman, who the authorities had not named as of Tuesday Ted De Jager, Superintendent of the Royal Canadian Mounted Police, said that the two men and women were killed in three cities in about three miles each other in the city of Penticton. The first shooting was reported at 10:30 a.m., and the suspect turned himself in at 11:30 am, he said. The victims were not identified pending notification of their families. But the police said they believed the gunman knew all the victims. "While the investigation remains active and ongoing, we believe this was a targeted incident," Mr. De Jager said at a news conference on Monday. The shooting was the deadliest record in Penticton, a city of about 34,000 people that is about a four-and-a-half-hour drive from Vancouver. Throughout the province, mass shootings are rare: It was only the fifth shooting in British Columbia that killed more than four people. The last such shooting was in 1996, according to Penticton Western News. It was not immediately known what type of gun was used in the attacks. Gun owners in Canada must be licensed. Before the license is granted, the officials check the buyer's past for any violent crimes or behavior, crimes involving firearms or violent episodes related to mental illness in the past five years. Handguns, semiautomatic and automatic weapons must be registered with the federal government Prime Minister Justin Trudeau has proposed extending the background review to the licensee's entire life while resuming record keeping for some rifles and shotgun sales, prompting a fierce pushback from some gun owners. The national long-gun registry, introduced in 1995 in response to a massive shooting of students in Montreal, was unpopular in rural areas, but supported by the police. Lawmakers in Quebec voted in 2016 to create the province's own registry, over the protest of gun owners. Officials have pointed to a recent increase in several gun-related crimes, including gun-related homicides. Canada's homicide rate has reached a 10-year high last year, driven largely by gang-related shootings, according to a government report. Debate over gun laws heated in Canada last year after shooting in Toronto killed two people and wounded 13 others in July. In response, the city council proposed a federal government ban for handgun sales in the city, while the Montreal City Council called for a national ban on the weapons.